We have been on the road for three weeks - and spent the last few days in Melbourne where we got to see this exhibition by Ron Mueck at the NGV. It was so worthwhile to experience art on this scale and of this nature. I was surprised by how accessible it was for just about anybody - they could easily relate and react to it. 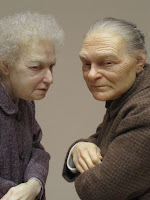 His work is so lifelike and realistic in its execution; yet often so out of scale as to cause you to step back and reflect. 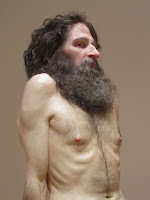 He works with polyester resin, fibreglass, silicone, horse hair, cotton and so on to create these human forms. The obvious reflections are about how ageing can make people appear less important, obvious or active; and how after life has left a body it appears diminished and shrunken. 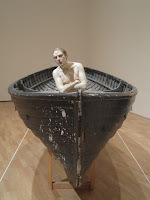 The oversized baby and woman in bed create uncertainty as we observe intimate moments writ large; as does the naked man in the boat - so vulnerable as he tries to see what lies ahead. Well talk about H in a hurry. Life can be chaotic and somewhat out of control at times; so I just had to rush through this one. Initially I had wanted to do a transfer onto aluminium but my printer didn't give enough "charcoal" to transfer; so then I tried to just write on aluminium with what I thought was permanent ink - a day or two later it rubbed off nicely thank you. Then I thought about etching into some metal (but forgot to ask my friend for the acid supplier) so parked that idea for now; then I thought I might do some drypoint scratching into aluminium - but time was short and my patience low, so figured that this might not be the time. So what did do? 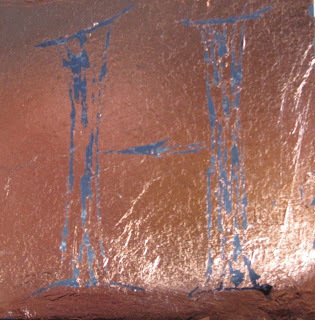 I used some sheet metal, 'painted' it with a nice grey oil pastel, put copper leaf over the top and used a bodkin type thing to work swiftly and pull away the copper - trying to keep the letter free without ripping off half the copper. Challenging but quick! 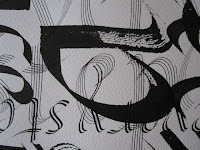 Things are ticking along quite well and I continue to be inspired and challenged to go make some letters. This is quite different to my others. 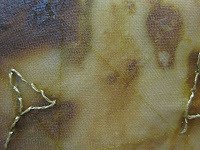 I wanted to work on fabric; and I chose this piece of rusted organza for starters. I rusted it early last year by wrapping it around rusted items, wrapping it up tight, submerging it in white vinegar and leaving in the sun for 2-3 weeks. Requires patience to avoid 'peeping'. 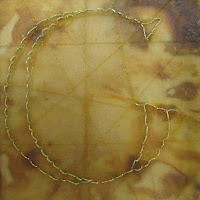 I then wrote a letter and traced it onto the fabric and stitched around the outside of the letter. 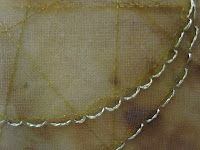 I wanted to try using metallic thread as well - quite a challenge on fine delicate fabric, but fun. I first of all tried two out of the six strands and it went wild, so I reverted to one strand (which was actually two very fine ones wound together). It worked quite well but bounced around a fair bit. 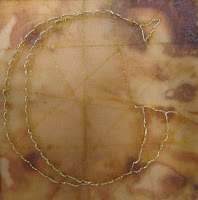 I then covered a piece of mat board with calico and wound the remaining gold thread strands around that, then covered it over the top with the rusted fabric and embroidered letter. Phew! 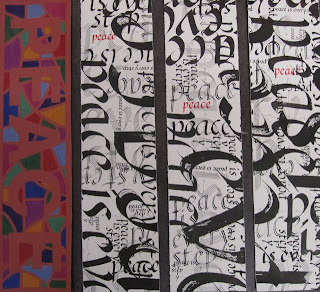 Words for Peace 2010 - all done!! It feels good to have completed these - this one took forever. I drew a rectangle and then worked with dividing lines and curves to organise the space. I was initially thinking of a stained glass effect and that these lines would be black, like on the windows. 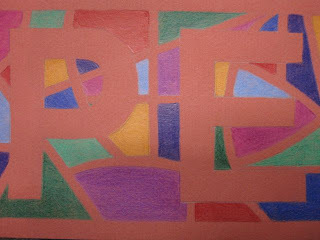 I then wrote peace in big block capitals - nothing fancy at all - and started to colour in the spaces. I used 9 coloured pencils and it was an interesting challenge to keep the colour, size, location and shape balances right. In the end I chose not to write the letters in black; nor to do the lines in black. I chose instead to leave the colour of the paper showing through and again remind myself that peace lies behind what we do; it emerges from chaos and is always there in our lives if we can look for it. These four will be popped in the post along with Barry's great effort here. This week is better paced and I seem to have time to get to my letters. 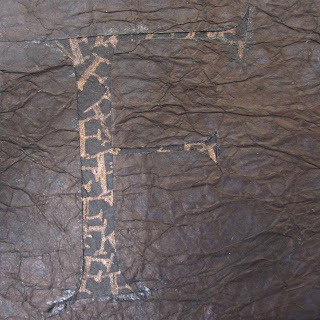 Here is "F" from the experimental alphabet. This is the second attempt. 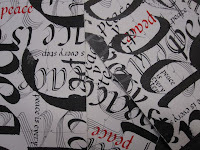 Firstly I tried to cut an F out of a white mesh/lace paper and glue it to black - it didn't work. I still wanted to experiment with the cut out letter thing, so I got some heavy blackish Thai paper and then thought - how would black cut out on black work? Thought again - probably not all that well. 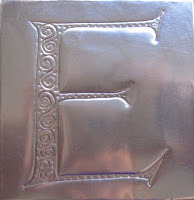 I then decided to write a series of small Fs in copper metallic pen on the thin black paper and then cut out the Roman Capital F from the thick blackish paper. I think it ended up looking like leopard skin kind of! Very happy to have attempted this - just another little experiment. 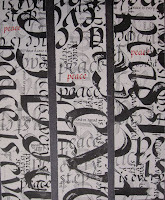 Words for Peace 2010 - one done! It was raining on the mountain over the weekend so I got the chance to hit the studio and get stuck into these Words or Peace bits for Mike. In the end the piece of paper I used was perfect for three broadsides that have to be 20 inches x 5 inches. 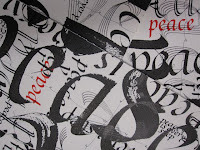 This suited my layering of the text "Every step is Peace" and so I wrote over and over and then cut the paper into the right sizes. I finished with a single red 'peace' on each. Once the other piece is finished, they will wing their way to America to join the show there. I think the plan is that four will be stitched together like a lantern (hopefully these three will be spread thru quite a few) and the lanterns hung from the ceiling in gorgeous display of colour and peace. We are still in the midst of rain but the sun broke thru briefly yesterday and we managed to see a wee rainbow. Apart from that Barry took this beautiful photo of a rainbow in my hand which really made me smile - the gift of rainbows. I am just sneaking my letter in in time this week! 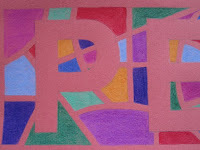 In many ways it has been a fabulous week because so many people have been posting to A Letter a Week 2010 and showing what they have done with their first four letters. I have been very busy helping out - getting photos compressed, giving basic how-to-blog tips and posting on behalf of those who haven't yet mastered the 'art' of blogging. It has been busy but oh so satisfying. 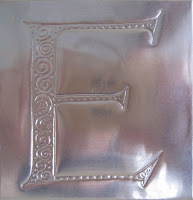 Despite that and a trip to Canberra for work in between, here is my letter "E". 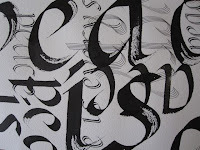 I think I really have to stop doing letters that are hard to photograph! I wanted to experiment with aluminium 'shim' and first of all tried to cut the letter out and found it was very hard (or at least beyond me at that point) to attach to timber; so have left that experiment for another day. 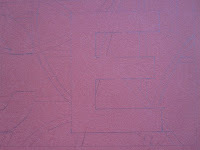 Instead I used a ball-point embossing tool to draw into the 'shim' and to decorate it. I then attached it to some mat board - just by folding it over. 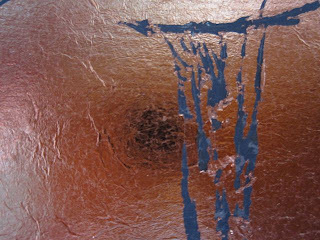 So again, I am pleased to have experimented with the materials. After fiddling about I have decided on two pieces - one using coloured pencils on Canson and the other using my favourite quote "Peace is every step" written over and over in italics in ink on Somerset watercolour paper. They are both underway and here are some early glimpses. 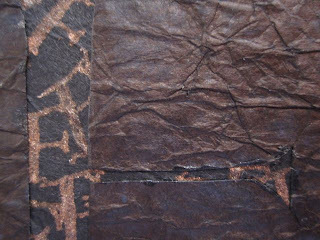 What appears to be blank paper actually has the pencil marks on it for colouring in purposes (might be visible when enlarged by clicking) and the stained glass effect I am after is also emerging from the second shot. Well the long, dry, hot spell has been well and truly broken. We had 150mm (6 inches) of rain yesterday and it keeps coming in torrents as we get the edge of former cyclone Olga. The valley is filled with mist and wisps of cloud and when the sun shines again we might get rainbows. 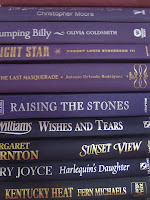 Here is one of my favourite rainbow elements- a stack of books. 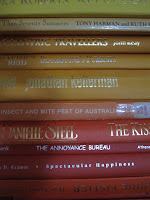 I hunt around secondhand shops and monster book sales not looking at the title or the author, just collecting the books with the coloured hard covers. I have learnt that blue is common and orange and purple very hard to find. I keep adding to the stack and hope that in a year or so it will reach the ceiling. I'm in no hurry but I do love it.